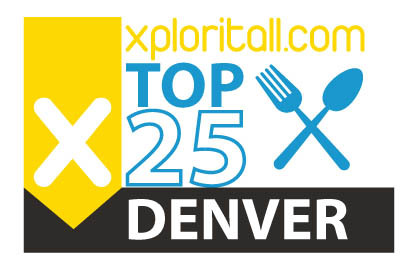 Xploritall announces the list of the 25 Best Restaurants in Denver. Using a complex algorithm (not really), we sorted through several key diner and critic ranking lists to determine the overall winners. This "poll of poll" balances the opinions of dining critics with actual diners. The winners represent a diverse offering of cuisines and ranging from casual to fine dining. Please note that Xploritall places less emphasis on opinions and rankings than other sites or media. There are lots of other great eats you should investigate while visiting Denver, so consider this list as just a starting point when planning your trip to the Mile High City. And don't forget to sign up to add these places to your travel planner. This Highlands neighborhood sister restaurant of fellow Top 25 Linger and newly opened Ophelia's has a field to fork mentality, and emphasis on organic, local ingredients. The menu focuses on vegetarian, vegan, food allergy concerns, as well as humanely raised meat products. Dustin Barrett and Amy Vitale, chefs and co-owners, created this small Park Hill neighborhood bistro with a similar approach to the menu and decor -- both seek to provide comfort and charm. A seasonally changing menu keeps things fresh. Quick-riser Work & Class describes itself as a “square meal, stiff drink, and fair price.” Its influences reflect the Midwestern and Latin American heritage of the owners. Work & Class is surging up the ranks of 5280's Best of list, and sits at #1 on Yelp at the time we compiled our list. This is restaurateur Frank Bonanno's flagship location (he also owns Top 25 placer Luca), though he gives the staff free reign. The ever changing menu features American-style food with traditional French techniques. Snooze is a semi-regional chain, with locations popping up in Arizona and southern California. But it’s still an institution in Denver. Serves breakfast and lunch in a retro, busy atmosphere. Leave room for their HUGE pancakes. The second restaurant launched by the owners of Sushi Den, Izakaya Den offers small plate style selections with international influences, as well as a large sake menu. It recently moved next door to Sushi Den inside a stylish, modern building. Located inside the historic Brown Palace Hotel, Palace Arms is consistently named as one of the best restaurants in the country, let alone Denver. Palace Arms is the place for special occasions, or for a well-earned splurge. A 3rd place on Zagat shot Sushi Sasa into the list. Features an extensive menu of Japanese dishes and sushi with an American twist. Denver’s most popular Vietnamese Pho restaurant, and for good reason. They even had to move to a bigger location a few years ago, and there’s a second location in Littleton. A nice, clean, lively restaurant and mighty tasty food, whether you’re in the mood for Pho or noodle dishes. The emphasis at The Populist is on community. Most of the seating is communal tables, and sharing the regularly changing line-up of small plate fare is strongly encouraged. A fresh idea that is quickly catching on. One of many restaurants owned by Chef Frank Bonanno (other Top 25 winner Mizuna is as well), the specialty at Luca is rustic Italian comfort food. 11 years old, Luca is not a fly-by-night location, but it has changed over the years without losing its appeal. You won't find much info on the internet about Queen of Sheeba. There doesn't seem to be an official website. You might even pass by the location without even noticing, even more so because of its faded sign. But it has quietly garnered so many favorable reviews from diners to have made the top lists on Zagat and TripAdvisor, as well as repeatedly winning the award for best Ethiopian restaurant in Denver by Westword newspaper. This might be one of the best examples of not judging a book by its cover. As an East Coast transplant, finding a decent pizza in Denver took a bit of searching. Marco's ended that quest. Their crust is the perfect balance of crunch on the outside, and soft on the inside that only a proper coal fired oven can produce. There are lots of specialty pies to choose from, or you can build your own. Ocean Prime is a semi-chain with new restaurants expanding to select cities around the United States. Serving up seafood (of course) and steak, it has been previously been recognized as the best seafood in Denver.